Could an art project in a 117-year-old house be a solution to homelessness? 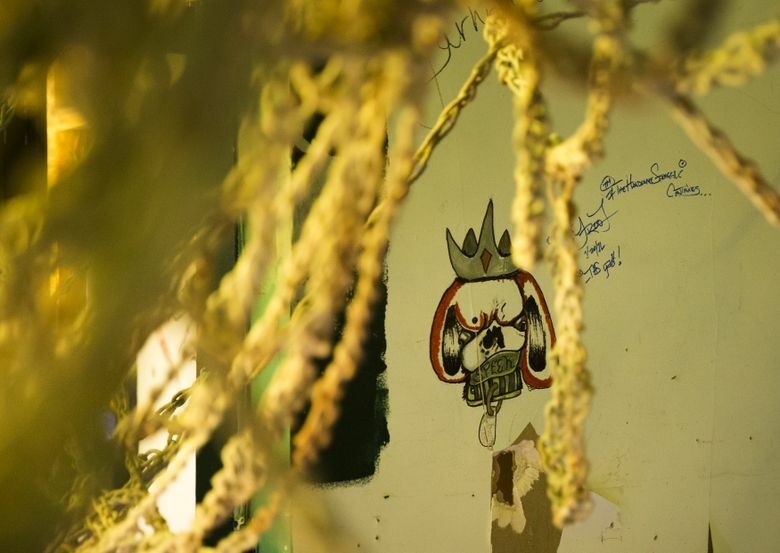 Artists behind the Seattle Demo Project alter doomed buildings with dramatic art installations, and hope to work with squatters to turn the buildings into transitional housing. If you happen to stroll by, the old house on the corner of 12th Avenue and Thomas Street looks like other empty houses waiting to be knocked down across Seattle: peeling gray paint, crumbling red shingles, rickety front steps that seem as if they’d melt the next time it rains. 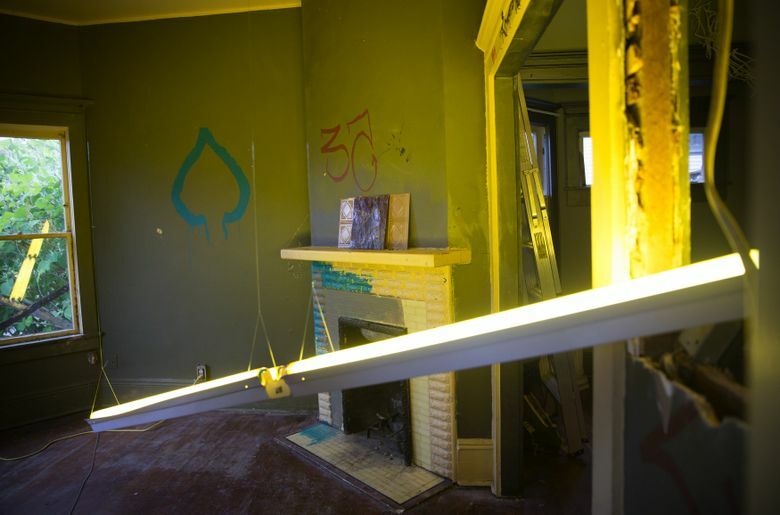 But an eerie, yellow glow radiates through its windows every hour of every day: This is “When Lightning Strikes,” an art installation by the Seattle Demo Project, a group of artists and architects who’ve been treating doomed buildings like blank canvases since 2012. 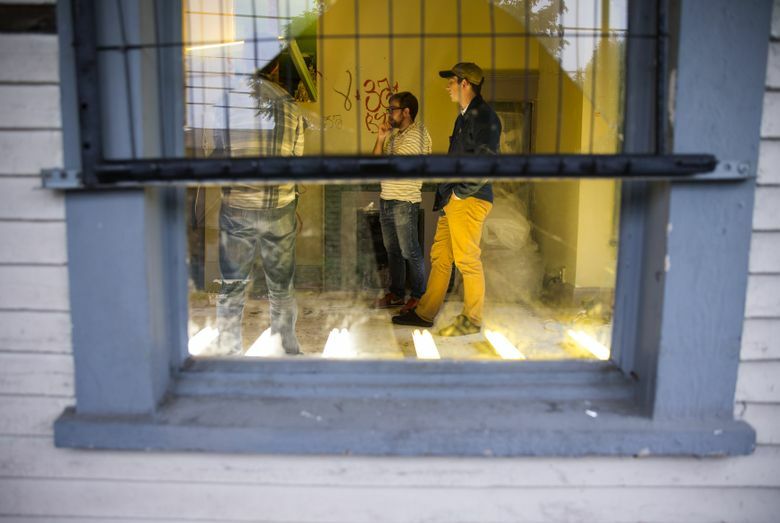 Their current project, the 117-year-old house at 12th and Thomas, is a mess of contradictions. A conversation about redevelopment in Seattle inside a teardown house that’s been turned into an art installation by the Seattle Demo Project. 6-9 p.m. Thursday, July 14, at 302 12th Ave E., Seattle (seattledemoproject.com). 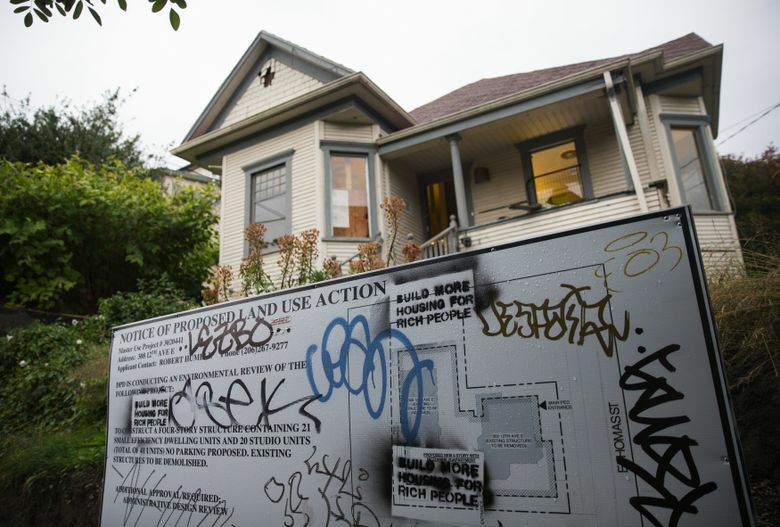 It’s a property where squatters, a developer, artists and anti-homelessness activists tried to make a tricky alliance — developer Robert Humble of HyBrid Architecture allowed the Demo Project artists (some also work at HyBrid) to turn a house he plans to raze into art, but also tried to be responsible about the squatters living there, one of whom was pregnant. 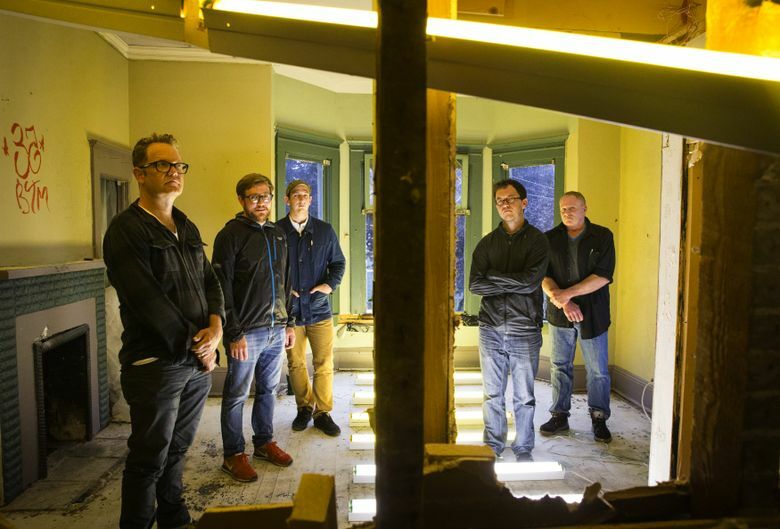 During a recent visit with Humble and the artists, the house showed residue from the former occupants and other Seattle Demo projects — fishing line on an old fireplace hearth, a battered plinth that the squatters left behind, broken glass on the floor, a washer/dryer unit tilting so far it threatens to break through the wall and a toilet bowl with an impressive mound of excrement. At first glance, “Lightning” is a straightforward project — find a teardown, make an installation — and one that has been done many times before. 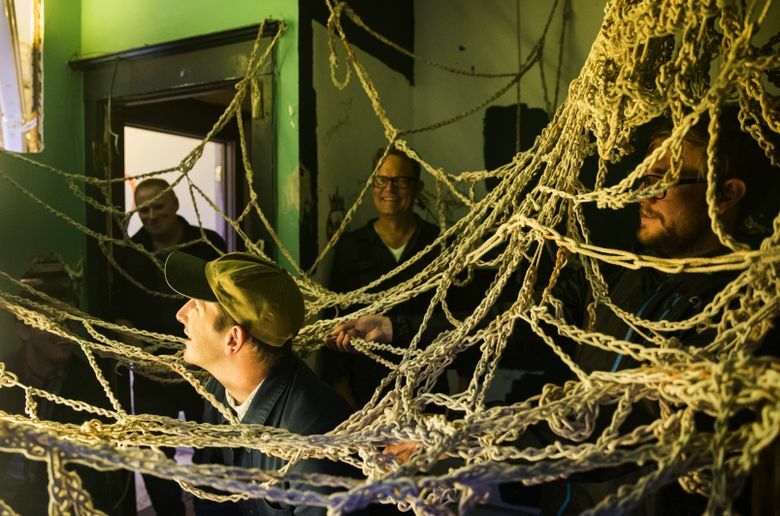 In 2011, local art trio SuttonBeresCuller used winches and straps to knit two doomed buildings together for a project they called “Ties That Bind.” In 2007, artist dk pan staged an impressive art happening at the Bridge Motel on Aurora Avenue, with graffiti and indoor fires, before it was finally abandoned. 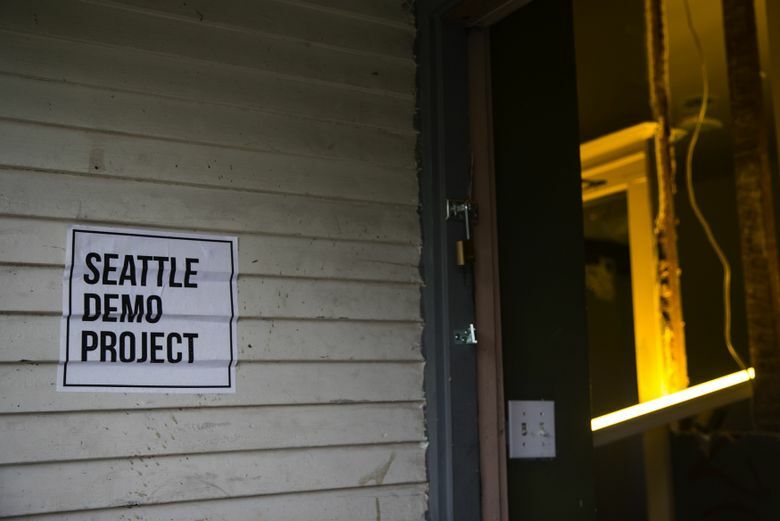 This Thursday, July 14, the Demo Project is hosting an event at the house called “Public Comment,” where Humble and the artists will invite the public into the house to talk about teardowns and redevelopment in Seattle.